Many parts of the UK are bracing themselves for further disruption today from fresh snowfalls with ice expected to be a major hazard on the roads. Northern Ireland, Wales and south-west England look as if they will be hit hardest but there are also severe weather warnings in place for north-east Scotland, the eastern Borders and eastern England. It is the earliest widespread snowfall for 17 years and the Met Office says the cold spell could last for a fortnight. 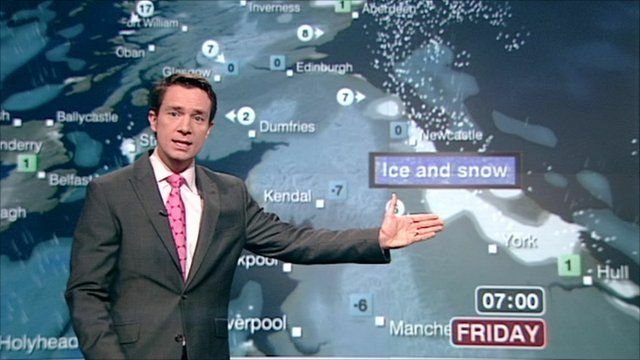 BBC weather presenter Alex Deakin has the latest forecast.